Mandela High School students express the realities of human rights issues in their lives. Rex Foundation Executive Director Sandy Sohcot says: On December 10, 2010, as part of the Rex Foundation’s ongoing The World As It Could Be Project, students of Mandela High School’s Law and Public Service Academy presented their first culminating performance to bring together their studies and reflections about how the Universal Declaration of Human Rights (UDHR) relates to their lives. This multi-media presentation, comprised of original videos, graphic arts, poetry, song, dance and spoken word, was a result of three Mandela teachers — Richard Charlesworth, Deborah Juarez and John Nepomuceno — attending the Rex Foundation’s first 3-day Institute on The World As It Could Be Project curriculum and committing to implement the curriculum as part of their fall 2010 language arts and social studies classes. 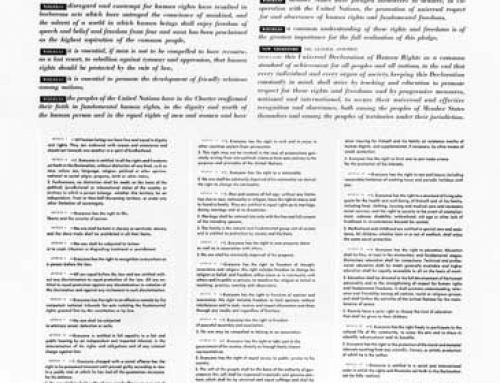 Other Mandela teachers joined in to include UDHR connections in their classes, including Anita Smiley, whose graphic arts students created the beautiful Human Rights Quilt shown in the recently published Mandela newsletter. 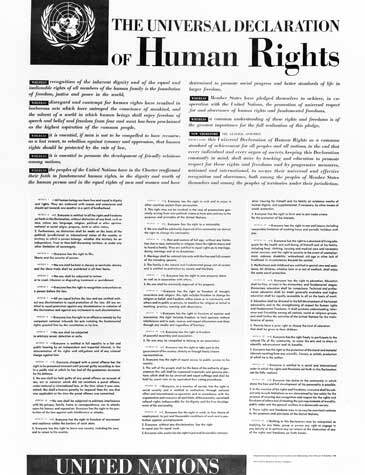 The Project curriculum, newly published in April 2010, uses the creative arts as a major element of engaging high school students to not just learn about the UDHR, but to grasp the connection of the otherwise abstract words of the Declaration to their own lives as well as those in the greater community. One student said, "This project was very exciting for us. We've never accomplished something so big. And, I even learned a lot!"